I do try to tell a story in every design, and I'm always looking for real world hooks and historical connections to support my design choices wherever I can. I thoroughly enjoy the research and reference gathering phase as its my chance to really get inside the space I'm creating for and produce something different, something with heart... for me it all starts at the grass roots reference phase. As part of a Concept Art workshop while with Krome Studios, my fellow concept artists and I came up with the challenge to re-imagine the traditional characters from Frank Baum's Wizard of Oz by overlaying a Feudal Japanese thematic styling. As a child I was raised on this kind of whimsical and highly imaginative narrative and so took to the task eagerly. 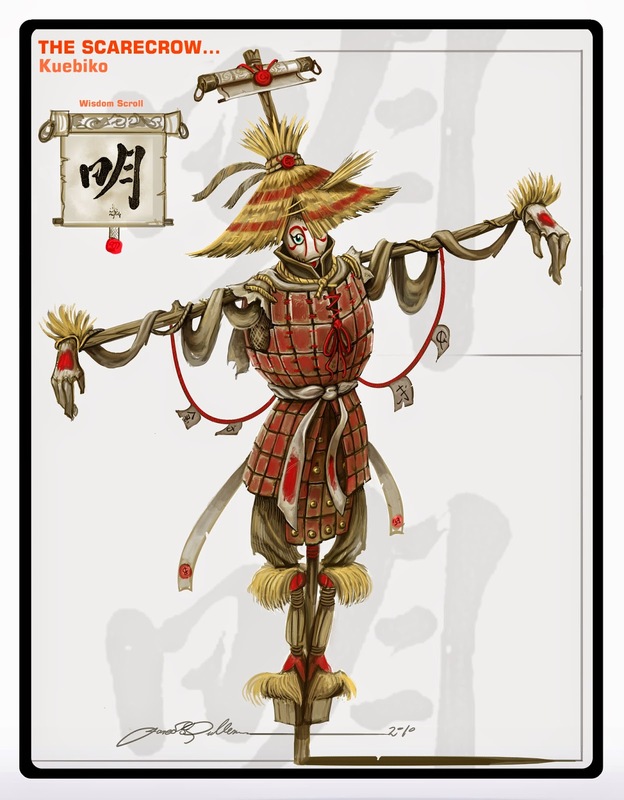 I chose to re-design the Scarecrow as I felt I best identified with him as I like to think, and talk, and talk about thinking... and for me the pairing of such a character with the romantic and evocative visual theme of Feudal Japan proved too tempting for me to leave alone. I felt the Scarecrow had a kindly, inquisitive and disarming nature and also saw him as a somewhat piteous creature; created for a purpose that was beyond his demeanor... to frighten and dissuade, and in this regard I felt he was very much like a broken thing. Imagery of the Samurai sprang to mind, but I thought it best to avoid my first obvious conclusion. Immediately Kabuki Theater entered my mind, as the Scarecrow was quite a dramatic and theatrical creature. His link to the land as an agricultural device appealed, so I resolved to make him more of an enchanted object rather than a freestanding character. 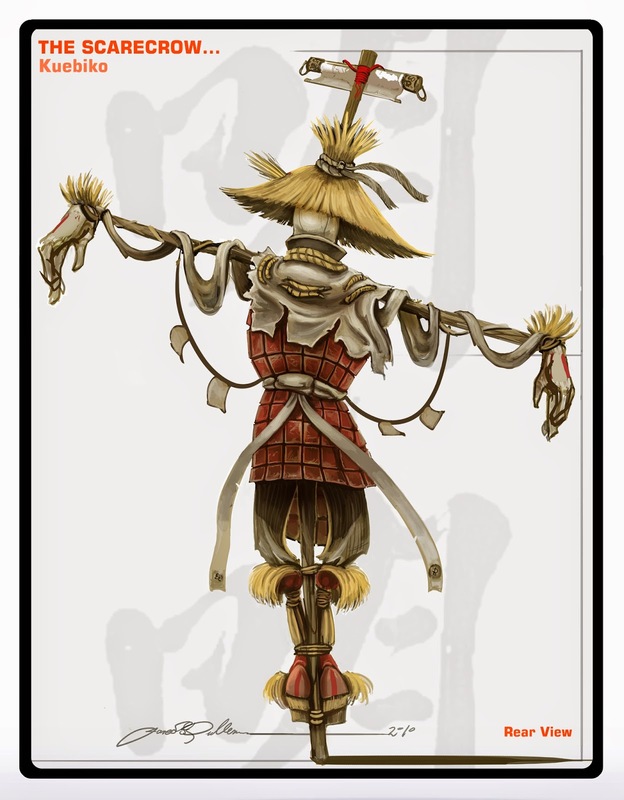 As I researched origins of scarecrows I stumbled upon a Japanese legend that spoke of a creature known as Kuebiko; a scarecrow that could not walk but had immeasurable knowledge of the world. For me this was all too convenient so I went down this path to create my painted, straw packed fellow. 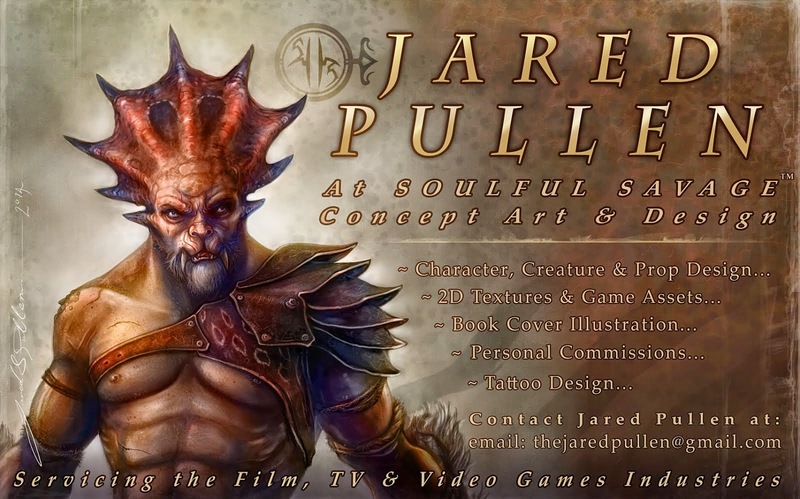 Having him permanently bound to his pole presented an interesting opportunity for both a unique design structure as well as animation. Originally I had his arms free of the pole apparatus but later tied them to it, as I felt this character had more important features to capitalise on than his arms. So I tied them and had the sleeves without stuffing so as to create a draped look to his arms. His hands however were very important to me... the hands of a gardener I imagined, and these could slide along the pole and gesture as they needed to. How something moves always appeals to me and having an animation background I try to provide evidence of this in every design. To get around I imagined the Scarecrow would hop like a po-go stick, and spin about... creating this guy was an absolute pleasure and I had hoped that Krome would explore this idea of a re-imagined Wizard of Oz given that the world of Oz is coming to grace the silver screen in the near future. Design wise the most important element of the scarecrow however was what he stood for; intellect... and more to the point his pursuit of it throughout the story. I wanted to represent the quality he was questing for as a tangible thing, and the scroll case that adorns his hat did the trick I feel. It's closed at first, obscured from his view, but when unrolled and revealed, the Kanji character for Wisdom is displayed. For me this was the unique story aspect that I wanted to inject into the design... representative of that moment in the story when the Wizard hands the Scarecrow his diploma and tells him, "it was with you all along." I truly identify with that. It reminds me of our own struggles as people and that sometimes, like the Scarecrow, we need to leave what is familiar behind and quest to find what we already possess.... if only to realise its full value. We can be powerful creatures when we so choose to be.....when we look inside ourselves and conquer self doubt and realise that we already have the wisdom within ourselves to overcome and be all we can be; for others, for ourselves... and for our Dreams. On the work front there have been difficult obstacles that have arisen underfoot, and for many of my friends, myself included, the way has been rough. However, the message I would send to those of us that have been forced to look elsewhere for work is this: Remember what you have inside. 'Know your value.' A good friend once told me that.